Chiang Mai Mail Editor Phitsanu Thepthong, 3rd left, Thai Lanna News Editor Nopniwat Krailerg, 3rd from right, and Naewna Newspaper reporter Suparak Jirakijyada, left, were guests of Kantary Hills Hotel manager Christian Roeschli, center, to attend the “Italian Food Festival”, which was organized at the Nimman Bar & Grill Restaurant from May 30- June 1. (Left photo) Christopher Mosby of Movaci (center) is joined by his lovely wife Boom (far right), his parents (left) and a family friend (center right) at the Spanish Food and Wine Tasting Event at the Wine Connection at Nim City Daily on May 21. (Right photo) Pierre de Pimodan, General Manager of Wine Connection at Nim City Daily joins Shana Kongmun, Managing Editor of the Chiang Mai Mail (right) and another guest, Morgan (left) for the wine tasting. Located at Nim City Daily, also known as Airport Rimping, the Wine Connection put on a fine selection of Spanish wines, white, red and sparkling along with hors d’oeuvres. Pierre de Pimodan, General Manager for the Wine Connection in Chiang Mai mentioned other branches of the store can be found in Bangkok, which has 9 stores, Phuket which has 6, Samui has 2 and Pattaya 1. Wine can also be purchased online for shipment anywhere in Thailand. 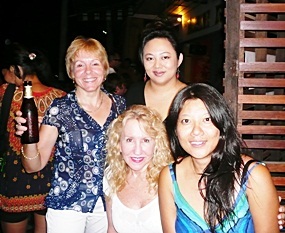 (From left standing) Micaela Hobbs of Crouching Tiger Cycling Tours, joins June Unland of Advanced ID Asia and (seated) Janice Jason and Mrinalini Rai at the popular open mike night at the North Gate Jazz Club on Tuesday night.